Overall, we've been happy with the Switch. The console has delivered on its promise to be both a home and mobile console, and Zelda is fantastic. It does, however, have a number of shortcomings. Some aspects, like the physical design and hardware, cannot be fixed without releasing a new, redesigned console (which Nintendo will almost certainly do in the coming years). But other elements we take issue with are software-related and could, conceivably, be fixed or updated with a patch. Here are five software fixes that need to be implemented as soon as possible. There are some handy ways to add friends on the Switch, like being able to add a person who is physically near you, or being able to draw from the friends you made in Miitomo. Friend codes, however, are still the best way to directly add a friend who is not standing next to you. The friend code system was abandoned for Wii U which made it surprising to see it return for Switch. To make it additionally confusing, I made sure to grab my preferred username back in February. Why did I do that if it was just going to be a friend-code system? Honestly, this is something I don't see changing, but we can all do our best to hope that it disappears in a forthcoming update. It was one of the big questions leading up to the system's launch that was answered with a press release eight days before the console's release with a half-hearted "No." In a perfect world, all of my Wii U Virtual Console purchases would magically appear on my Switch, but even with reasonable expectations of having to buy those games a fifth time (original release, Wii, Wii U, 3DS – I'm looking at you Mega Man X) it would have been nice to at the very least have Super Mario Bros. NES up on the store for purchase. We don't know when the Switch's Virtual Console will appear, but hopefully it's soon. With the success of the NES Classic Edition console, it makes you wonder if Nintendo wants that to be its singular avenue for selling classic games. I hope that's not the case. Nintendo wants the Switch to be a gaming console first and foremost, and I can appreciate that, but you can't ignore the fact that many people use their gaming consoles to watch television. The Switch would be a good candidate for watching Netflix, too, considering you can quickly take the thing off your TV and take it to... other rooms in the house without having to pause, and immediately put it back on the television when you return to whatever other room you decided to go to. Also, with its tablet-like abilities, a web browser would be much more useful on Switch than it is on Xbox One and PlayStation 4 and their controller inputs, as a point of comparison. We'd like to see these kinds of applications made available for the console soon. Speaking with The Washington Post, Nintendo president and COO Reggie Fils-aime recently said, "We’re talking to a range of companies about other services, companies like Netflix, Hulu, Amazon – things that will come in time," which is good news. For more details on this topic, head here. 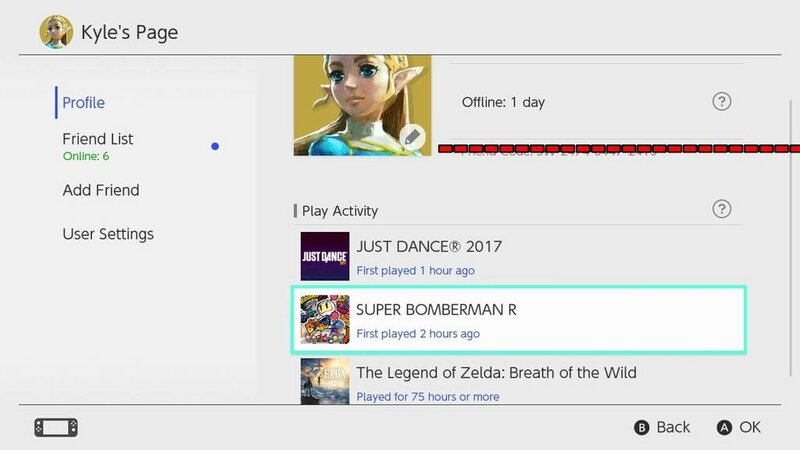 The switch is already tracking how much you're playing. It gives you an hour count after playing a game for a week, and you can also use the parental app to monitor how much a game is being played in real time. The 3DS has my favorite game time tracker of any console by ranking your most played games and showing you how much time you've spent with each game down the minute. I want Nintendo to wholesale rip itself off and just do what it has done for 3DS on Switch. The data is already there hidden behind the operating system curtain – just let us see it. The only thing you can do with your save files right now is delete them. That's it. You can't back them up, or transfer to them to a different console, and it is one of the console's most confusing shortcomings. If your Switch breaks, even under warranty, you've lost all your Zelda progress. If you want to replace your Switch with a new one when the inevitable redesign appears, you will have to re-unlock all those 1-2-Switch games (editorial note: we actually don't recommend doing this). When asked about this shortcoming Nintendo said, “At this time, it is not possible to transfer save data from one Nintendo Switch system to another.” The phrase, "At this time," implies that a fix is on the way, which is good, but why it isn't here to begin with will always be a head-scratcher. For our review of the console, head here. For our review of the Switch's best game, The Legend of Zelda: Breath of the Wild, head here.